High quality critical study of elite Jewish communities, and their ethnic activism and biases, is extremely rare today — not surprising given the enormous disincentives against such research. As a result, we inevitably must rely on non-institutional, often one-person efforts, the most celebrated being the work of Professor Kevin MacDonald and in particular of his seminal The Culture of Critique. MacDonald is not alone however and, though these works are often disconnected, other scholars conducted similar work, often being better placed to examine their particular national context. For the French case, we can salute the work of Identitarian activist and international civil servant Anne Kling for her meticulous studies, with no less than five books on Jewish political activism and one on the Front National. I here review two of these books dealing with Jewish ethnic activist organizations. The first concerns the International League Against Anti-Semitism and Racism (LICRA), perhaps equivalent to the Southern Poverty Law Center as an organization that is not explicitly Jewish but is mainly funded and controlled by Jews. 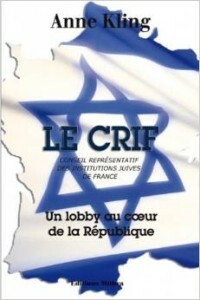 The second organization is the Representative Council of Jewish Institutions of France (CRIF), the official Jewish lobby. Le CRIF and La France LICRAtisée (literally “Licratized France”) are extremely rigorous works and, as well shall see, their conclusions are highly compatible with The Culture of Critique. In short, these Jewish groups have spearheaded efforts to delegitimize French ethnic identity and indeed the French nation itself, to destroy majority self-confidence with references to “racism,” colonialism and the Vichy Regime, to aggressively promote Afro-Muslim immigration and “multiculturalism,” to marginalize the Front National from any participation in politics, to censor speech found threatening to perceived Jewish interests, and raise the Holocaust as the supreme crime above all crimes that legitimizes their activism by placing Jews as the supreme victims. This activism, plainly, is based on ethnically-motivated hypocrisy and selfishness, evident in the LICRA and CRIF’s simultaneous support for Israel as an explicitly Jewish ethno-state. Kling shows how these two organizations have unrivaled access to the French political establishment, skillful and aggressive lawyers, and many friends in the media who are happy to act as a megaphone. She has done a formidable scholarly work, largely using the LICRA and CRIF’s own documentation, systematically combing through their articles, press releases, statements and other media over the years, and placing them in the evolving French political context of the past decades. In effect, Kling chronicles a kind of slow motion “fall of France” since World War II from a merely Jewish-friendly regime to a downright Judeo-centric and even anti-native French one — the fruit of seven decades of ethnic networking and cultural struggle. Let us be explicit in that it is question here only of the LICRA and in no case of the French Jewish community, whose members represent all sensibilities, notably political ones. It would then be perfectly wrong, and false, to confuse the LICRA and the Jewish community. How terrible, to become Frenchmen among others, without more rights or privileges! Simple private citizens. To no longer be able to raise a storm, demand, palaver at the highest levels of the State! One understands that the specter of assimilation has begun to haunt the dreams of some community leaders. A weakness of Kling’s approach is that she does not really explain why the LICRA and the CRIF are so influential. The gaps can easily be filled in with a reading of The Culture of Critique and “Understanding Jewish Influence” (which, Ms. Kling wrote me, she has not read, evidently independently coming to similar conclusions). The two organizations’ power in France becomes less mysterious if one knows that Jews make up 1% of the French population and about 15% of French oligarchs, with analogous over-representation in other influential organizations, especially the media, political parties and legal profession, which naturally ethnically biases the way power is wielded in the country. The LICRA and the CRIF must be understood as the mere tip of a vast iceberg: The radical vanguard edge of a community whose biases and influence extend deep into politics, law and the media. I must say the picture that emerges from Kling’s study is unpleasant in the extreme. The “Gaulish” have indeed sunk low in the face of their Levantine guests: French nationalism is persecuted, Israeli nationalism is supported, communist crimes are forgotten, Vichy’s crimes are endlessly commemorated, native French culture, Christianity and indeed Islam are constantly denigrated, while Jewish culture is completely off limits for criticism. In turn, this moral inversion legitimizes the gradual reduction of the native French to a minority in the face of sustained Afro-Muslim settlement. These assumptions have gradually been adopted by the very highest representatives of the French state, starting with the President of the Republic and the Prime Minister. This is humbling reading for any self-respecting Frenchman. What’s more, Kling’s work is effectively a meticulous, even painstaking documentation of constant ethnically-motivated bad faith, double standards, lies, exaggeration, hypocrisy, hysteria and pushiness on behalf of the LICRA and the CRIF. I have to say even writing this review has been somewhat difficult for me: It is more agreeable to discuss the exploration of the truth than the discrediting of lies! I saw a bon mot circulating recently: “The amount of energy required to discredit BS is of an order of magnitude greater than that required to produce BS.” Does this sentence alone not explain Jewish privilege and the decline of European Man in our homelands? From the English language, the French use the expression fair play; from Yiddish, they use the word chutzpah. Does this example alone not illustrate the tragic fall of the noble WASP? That it is easier to assert a lie through bad faith than to prove a truth in good faith (good faith which inevitably entails doubt). Ethnically-motivated lies, outside of the particular low-population density environment of Ice Age Europe, are evolutionarily adaptive. According to one Yiddish proverb: “A Jew is 28% fear, 2% sugar, and 70% chutzpah.” This would certainly apply to the LICRA and the CRIF: unappeasable, constant, paranoid fear (sometimes justified) motivating absolute selfishness, shamelessness and hypocrisy. French writer, Identitarian activist and international civil servant Anne Kling. Anne Kling has an unusual profile for an Identitarian, being an international civil servant working for the Council of Europe (that’s the pan-European body, including Russia, based in Strasbourg, not the European Union). 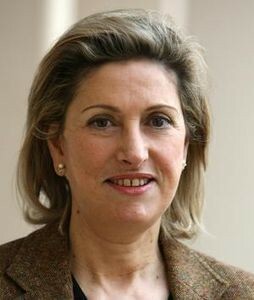 She became active in nationalist politics in Alsace and was brought before the courts by the LICRA in August 2000 for “incitement to racial hatred.” Her crime? Kling had highlighted in an election tract the fact that poorly assimilated and integrated African youths were disproportionately involved in violent crime. I have not been influenced by books, but by realities and facts, which are all the more telling. The LICRA attacked me and asked that I be fired by a court for “incitement to racial hatred.” Following this event, which was very unexpected for me at the time, I began to question the great power of this organization, able to ostracize those it dislikes from politically correct society. Through my investigation, I discovered its communist origin and its constant and not-disinterested support to the ideas of the left. . . .
By working on this topic, I discovered all the political and financial implications which resulted from this and were never mentioned by the journalists serving the system. Yet all this was very interesting. I therefore pursued my investigations and other books followed. I thank the LICRA for this. Jews in France are on the whole a privileged group benefiting from staggering over-representation among the economic, political, legal and cultural elite. As in other countries, these elites use their power to ostracize, demonize and persecute anyone who critically discusses their inevitable ethnic biases and activism. 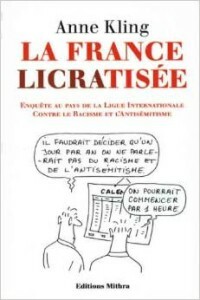 Jewish ethnic activism in France, as with all forms of activism and influence-peddling, is naturally shaped by the characteristics of the local power structures. These contrast somewhat with those in the United States, being more small-scale and more concentrated in Paris. There are historical differences. Instead of a WASP elite, France had a Catholic aristocratic elite with no equivalent in the U.S. This Catholic elite was gradually overthrown by a bourgeois and Masonic elite between the French Revolution of 1789 and the conclusion in 1906 of the Dreyfus affair. This bourgeois elite was naturally vulnerable to Jews achieving commanding over-representation among them through their talents and ethnic networking. While the traditional American nation is delegitimized by focusing on the conquest of Amerindians and enslavement of Blacks, France is delegitimized through the history of colonialism and the Vichy Regime. Jewish power in France reflects the particular, highly concentrated nature of power in the country. Elite power in the U.S. exercises itself through enormously influential, globally unrivaled power nodes of money (Wall Street, oligarchs), culture (Hollywood, Ivy Leagues, media) and politics (campaign financing, Washington/New York law firms). While the degree of interdependence and symbiosis of these power networks and corporate/government bureaucracies is significant, it appears to be less than in France. Economic power in the U.S. is somewhat polycentric, with fairly autonomous major industries such as oil and gas, Silicon Valley, and the defense industry. Major governmental bureaucracies can also have some autonomy and remain under relatively “WASPy” management, such as the State Department, the Armed Forces and the National Security State. Many of these power nodes are not particularly Jewish-dominated. In France has one sixth the population of America and is much centralized politically, economically and indeed demographically in the capital of Paris. Power networks appear at once much more “artisanal” (more human, less systematized, more amateurish, like that of a large American state) and more concentrated. Business (banks, defense industry, energy, telecoms) and culture (state TV, film, newspapers, magazines, grandes écoles) are much more closely bound up with, and dependent on, the state as regulator, subsidizer, major client or even owner. Jewish economic power appears to be considerably weaker in France than in America. Jews in France represent about 15% of oligarchs. Jews appear to be far less predominant in banking and in particular in central banking, the European Central Bank being an overwhelmingly goyishe operation. Jewish cultural influence appears to be similar to the U.S., Jews forming a substantial part of the media-academic-cultural apparatus (both as owners and employees) and a staggering proportion of public intellectuals (perhaps 50%; as in the U.S., in France these figures, often mere sophists, are marketed as “philosophes”). They also form a significant but not overwhelming number of party apparatchiks (especially on the left) and a large number of elite lawyers. This dispersion makes for an uncanny amount of influence, ethnically biasing politico-cultural power in France in favor of their interests. The oligarchs and lawyers thus create well-funded and skillful ethnic lobbies — a veritable alphabet soup of ethnically-motivated organizations in addition to the CRIF and LICRA, such as the UEJF (Union des Étudiants Juifs de France) student organization or the more ecumenical anti-racist MRAP (Mouvement contre le Racisme et pour l’Amitié entre les Peuples). These radical vanguards will find a sympathetic ear in the media insofar as ordinary Jews are responsive and non-Jews adopt their cultural assumptions (increasingly the case as the culture war has rolled on). To summarize, Jewish power in America is primarily cultural and economic, and in that sense it is difficult to fight against because it so amorphous and apparently legitimate within the U.S. democratic system. In France it is equally cultural, but less economic, more focused on personal ethnic lobbying and judicial activism. In addition, France has slowly but steadily been subjected to the wider anti-European culture emanating from America. French official culture has lost much of its attractiveness among the French people due to its being simultaneously parochial/inbred and anti-national — representative of an impotent former nation-state. In contrast, the Ivy Leagues and Anglo-American media have considerable prestige in France, with mass culture being largely dominated by Hollywood, American TV and Anglo-Jewish pop music. France is therefore also increasingly subject to the wider culture of critique emanating from the U.S. which is perverting the West as a whole. Besides her studies of the CRIF, LICRA and FN, Kling’s books examine Jewish Communist revolutionaries, false Holocaust stories, and Holocaust reparations. Anne Kling, La France LICRAtisée: Enquête au pays de la Ligue Internationale Contre le Racisme et l’Antisémitisme (Mithra 2007), 16. Anne Kling, Le CRIF: Un lobby au cœur de la République (Mithra 2013), 268. This is only one example of the self-defeating nature of Jewish ethnic activism, which inevitably leads to contradictions requiring further activism to address, a complex and unstable dialectic. The more successful Jewish organizations are in suppressing discussion of “the Jewish Question,” the more powerful they appear and show that the question is a legitimate one. The more they portray the whole of Western and indeed world history as one of constant anti-Semitism, with virtually all great thinkers prior to 1945 being Judeo-critical, the more one is made to ask why Jewish culture alone attracts such criticism and animosity. It would seem the fashion industry would be one of the few leading sectors not completely entangled with the state. That being said, it appears many senior ECB officials are embedded within the basically Anglo-Jewish culture and power networks of Wall Street and the City of London. For example, ECB President Mario Draghi is a former cadre of Goldman Sachs.